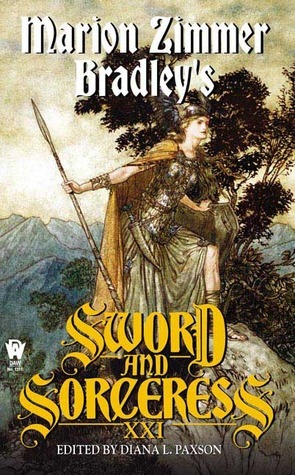 Originally, Marion Zimmer Bradley started the Sword and Sorceress series to further strong female protagonists in the sword and sorcery genre. She saw the need to change what she considered an appalling attitude toward women in these works. Dawn and Dusk — Dana Kramer-Rolls – Dagne, with the different colored eyes, grew up ostracised by her father, step-mother and brothers for being a freak. In the end she has to run away to protect herself. We meet her in a cabin in the woods on a cold and bitter night. Spell of the Sparrow – Jim C. Hines – A family of two ex-thieves and a budding wizard ought to be a dream come true. But parents will be parents everywhere, and our two ex-thieving parents do not approve of Mel’s dabbling in magic. That is all about to change when poor old dad is spelled by a Cloudling. The Woman’s Place — Susan Urbanek Linville – The continuing welfare of the tribe is of prime importance. When winter threatens to destroy all of the, grand-dame has to make a choice that will mean life or death to them all. Kin — Naomi Kritzer – Once magic has been properly woken in a person, they become addicted to the feeling. Julia is going to have to make the choice between her magic or the saving of a child. Child’s Play — Esther M. Friesner – Mira’s father is the richest man for miles, but that does not make a difference to either of them when Mira’s mom dies. When a new woman moves into the house, Mira knows she is in trouble. Thankfully she has her teacher on her side, a teacher willing to go the extra mile to protect this child. Ursa — Jenn Reese – A child was placed on a mountain side to die. Saving it changes the life of Ursa and the father. Red Caramae — Kit Wesler – Caramae sneaks into the catacombs of the wizards looking for an object of power. What she finds is more than she has bargained for. Parri’s Blade — Cynthia McQuillin – When Soela steals away with a blade that was supposed to follow Parri on his pyre, Hamli goes after her to right the wrong. What she discovers is that grief has many ways of expressing itself. Necessity and the Mother — Lee Martindale – In Hemfrock Donta runs the inn – The Mercenary’s Mother. It has an excellent reputation and is popular with all kinds of customers. When the city council decide that all metal in the city must be confiscated for the sake of magicks, Donta and her crew pack up and go somewhere else. What will the city council do when they discover that perhaps their decision was a bit hasty? Sun Thief — K. A. Laity – This is a story of the sacrifice rebelling against her fate when she discovers the truth about the alleged god she is being sacrificed to. Lostland — Rosemary Edghill – Ruana Rulane was a proper hero, the kind with a special sword and a destiny to fulfill. Not everyone wants her to keep her sword or for her to stay true to her destiny. Betrayal sends her to Lostland, from which very few people have returned. Plowshares — Rebecca Maines – When Elisabeth loses her husband to illness, she decides to go on pilgrimage to the holy cathedral. Her journey will teach her a great deal about herself and the role of women. Step By Step — Catherine Soto – After betrayal from their uncle, Lin Mei and her brother have taken to the roads as caravan workers. One night they are attacked by robbers. Favor of the Goddess — Lynn Morgan Rosser – An unknown woman is hiding from the guards. She isn’t sure why she keeps on fighting them and running away, she just knows that she has to. Then the Empress is scheduled to appear on the Holy Moon. Rose in Winter — Marie M. Loughin – Rosabel has three chances to grab happiness. Some choices are life-defining. Kazhe’s Blade — Terry McGarry – Kazhe prefers staying drunk to stay the memory of her loss. Then the loss comes to her opening old wounds. The Skin Trade — Heather Rose Jones – Being a Kaltaoven – skin wearer – is a quality the Marcalt of Wilentelu would like to possess. When two come to town, he uses all of his persuasive powers to give him the gift. Multiple Choice — Leslie Fish – Magic is exacting business, but is a useful tool in discovering the truth. When the old wizard dies and leaves his cabin for the next one coming, the wizardess discovers that he is haunting it. She calls him forth and asks him a few questions. Oulu — Aimee Kratts – Hilda Lajatur decides to quit the village she is living in so she can go to warmer areas. But not everyone in the village is happy about her choice and decide to kidnap her. A Kind of Redemption — John P. Buentello – All I’m going to say about this story is that it is a proper ghost story. Journey’s End — Dorothy J. Heydt – Looking for answers to her questions to the death of her husband, Cynthia goes into a cavern of the gods. Love Potion #8½ — Marilyn A. Racette – Sometimes when customers do not wish to pay the full price, one must use imagination to change their minds. There were three stories that I especially liked: Jim C. Hines – Spell of the Sparrow for the ingenious way mother and daughter solved their problem, Dana Kramer-Rolls – Dawn and Dusk for its retribution, and Marilyn A. Racette – Love Potion #8 1/2 for its wit. The stories are all good. Some are quite serious: Susan Urbanek Linville – The Woman’s Place and some quite swordy (and humorous): Lee Martindale: Necessity and the Mother.